New Matthew Bible Project - Restoring the Matthew Bible. In the early 1500’s it was illegal to translate the scriptures. It was illegal even to own or to read an English Bible.1 To defy these laws could mean imprisonment, inquisition, torture, or death by burning alive at a public stake. Nonetheless, in face of such danger and persecution God moved and greatly used three men in the translation and production of the Matthew Bible: William Tyndale (c.1494-1536), John Rogers (c.1500-1555), and Miles (or Myles) Coverdale (c. 1487-1569). William Tyndale: England was unsafe for a Bible translator, so William Tyndale worked in exile from hiding places on the continent. There, in difficulty and poverty, he began the great work of translating the New Testament from Greek into English. He believed God had called him to this work,2 and history has confirmed his calling. He was a learned man, a top notch grammarian, a lover of God’s word, and fluent in eight languages including German, Spanish, Greek, Latin, Hebrew which he learned later in life, and of course his beloved native English. In translating the New Testament, Tyndale worked largely alone, using the Greek scriptures compared and compiled from original manuscripts by the Dutch scholar Desiderius Erasmus. He also used a minimal number of other resources including dictionaries, grammars, and Martin Luther’s German translation. His New Testament was first published in 15263 and the little bibles, so small they could fit in your hand, were smuggled into England in bales of cotton, where people hungry for truth purchased them at great personal risk. As for the Old Testament, the ringing words of the book of Genesis and all the Pentateuch, which we know from the King James Version, are for the most part Tyndale’s. He first published the Pentateuch in 1530 (later revisions followed), and the book of Jonah in 1531. He had apparently progressed to translations of Joshua through Chronicles also, and possibly more,5 but these were not published before he was betrayed to his enemies and captured. After his betrayal, Tyndale was imprisoned for 18 months in Vilvoorde on the continent. In 1536 he was condemned for heresy and then ‘degraded’ (stripped of priesthood in the Roman Catholic Church), publicly strangled, and his body burnt at a stake. He was about 42 years old. 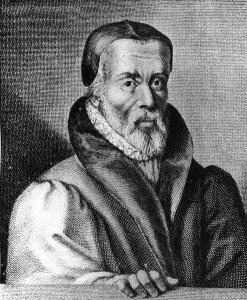 Thus it was that William Tyndale gave his life for English peoples, to give them the word of God. John Rogers: After Tyndale's martyrdom, his friend John Rogers took possession of his manuscripts. Tyndale had met Rogers in Antwerp, and was instrumental in converting him from Roman Catholicism. Having Tyndale's work in hand, Rogers set out to publish a complete bible. 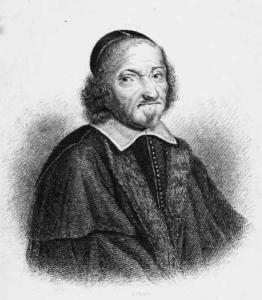 To make up what Tyndale had not been able to complete, he used the the Old Testament and Apocryphal translations of Miles Coverdale. He added a lengthy Table of Principal Matters, a summary of basic doctrines of the bible, based upon that contained in the 1535 bible of the French reformer Pierre Olivetan. He added many other badly needed helps for readers who were then almost biblically illiterate. Altogether, it was a colossal job of compiling, editing, and organizing. Rogers then published the complete work under the name "Thomas Matthew" in 1537. It quickly became known as the Matthew Bible, or Matthew's version. In 1549, publishers Raynalde and Hyll issued a reprint, and a final edition appeared in 1551. John Rogers was seized and imprisoned in the Marian persecutions and, in 1555, was burned at the stake for heresy. He was the first burning victim of Bloody Queen Mary, who was estimated by John Foxe to have burned alive over 280 men and women. Rogers left behind a wife and eleven children, one still sucking at the breast. The Matthew Bible, therefore, is the true fruit of martyrs’ pens—the word of God purchased with blood. And we know from the scriptures and from history that blood is commonly the precious ink with which our God attests to a significant work and confirms its authenticity; it is his seal of approval. Furthermore, as to Tyndale's portion, the Matthew Bible scriptures can claim to be the first printed scriptures translated into English from the original Greek and Hebrew tongues. Miles Coverdale alone survived the persecutions, fleeing to the Continent to work there on bible translation. He worked on many bible versions over the years, however his contribution to Matthew 's version was from his first translation of 1535. Bible historian A. S. Herbert (see below) comments that this was his best. It was certainly his most fresh and independent work. To read the Psalms and Proverbs from his pen, as contained in the Matthew Bible, is to come into fresh and meaningful light. His prophetic books are very clear. Some historians report that Coverdale and Tyndale worked together from time to time, especially on the Old Testament Pentateuch in 1529-1530. It is generally agreed that Coverdale's translation of the Old Testament and Apocrypha supplied the Matthew Bible with what Tyndale was unable to finish, except the prayer of Manneseh. Coverdale, not apparently fluent enough in Hebrew to translate directly, worked from Martin Luther's independent German translations, with reference also to the Latin Vulgate and other helps. 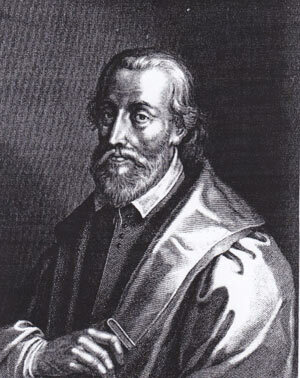 Coverdale is noted for his renderings of the Psalms, which were carried into the Church of England's Book of Common Prayer. I find that his work reveals a fineness of thought that can add clarity to Tyndale. Coverdale also gave us many precious translations of the works of other men from the German language, including Otho Wermullerus. (These are available in Parker Society editions.) He died at an old age in his home country of England. The Matthew Bible is important for reasons this editor is still learning to appreciate. For one, the Matthew Bible is a truly uncompromised English Bible. We say this because Tyndale, and Coverdale at the first, when working with the scriptures, were bound to no ruler or authority, no denomination, no political considerations, no requirement for consensus or compromise, but God only. Indeed compromise was not an option, either to assist in publication or distribution, or to earn the translators any favour with men, especially those in power, most of whom were opposed. No doubt this ensured the purity of the work; the Lord brought His word forth in English through chosen vessels at a time and in circumstances when He would stand alone in their concerns and affections, conscience and the Holy Spirit alone constraining them as they sought accurate expression. It is truly a separated work. When we search the Old and New Testaments we see that it is most often the lowly and the separated whom God raises up to do His greatest works (consider Luke 9:48). Such were the fishermen and tax collectors who became God’s Apostles. And, in a different sense of course, such were the authors of the Matthew Bible. Tyndale’s contribution to later Bible versions went largely unacknowledged, 14 but his ambition was not his own glory, but for God’s word, which was sufficiently preserved that it continued to bless Christians in the following centuries. Nevertheless, a good case can be made for bringing his work forth again, together with Coverdale's and Rogers' contributions to the Matthew Bible, so that people can compare Matthew's version with later ones and get a sense of what has been changed, added, or lost. There are many things worthy to be called treasures in the notes to the Matthew Bible, containing doctrines of the Reformation and of the ancient Church, and answers that are hard to find today. The Matthew Bible has historical value. From it we learn about the struggles of faithful men who challenged apostasy and false teaching. Some of the notes touch on the issues of the day, and are not as bitter as some have made out. The Reformers lived in very dark times. 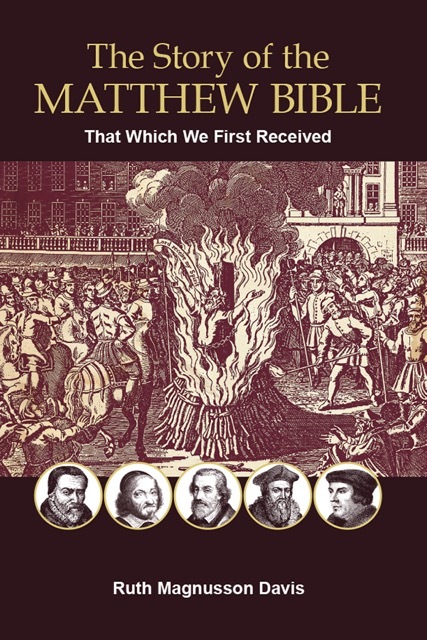 We believe the Matthew Bible to contain English scripture translations and commentaries greatly inspired by God, who worked through His chosen vessels raised up for that very purpose at that critical time, and that this martyrs' bible, sealed in blood, reveals the divine hand. 1 The history of the Bible and William Tyndale are taken from: (1) Brian Moynahan, God’s Bestseller (New York, St. Martin’s Press, 2002) (2) David Daniell, Introduction to Tyndale’s New Testament (New Haven and London, Yale University Press, 1995), (3) David Daniell, William Tyndale, A Biography (New Haven and London, Yale University Press, 1994), and other biographies and Bible histories. 3 Facsimile copies of the delightful 1526 Tyndale New Testament are available now to the world at large, through any major book seller. Tyndale then put out a new edition in 1534 (actually followed by one more in 1535). Modern spelling editions of Tyndale’s 1534 New Testament and 1530 Old Testament, edited by David Daniell, can be purchased through any major bookseller. 4 A. S. Herbert, Historical Catalogue of Printed Editions of The English Bible 1525-1961, Revised and Expanded from the Edition of T. H. Darlow and H. F. Moule, 1903 (London, The British and Foreign Bible Society, 1968), 7. 5 Herbert, 18. See also David Daniell’s comments on the authorship of this portion of the Matthew Bible Old Testament, as contained in his introduction to Tyndale’s Old Testament,(New Haven and London, Yale University Press, 1992), xxiv-xxvi, or for another view, see Joseph Chester's biography of John Rogers (London, Lougman, Green, 1861), for example at page 58. 8 Herbert, 19. In this ordinance it was also required that all the notes and commentaries in the Matthew Bible be obliterated, or they could not be put out for reading in the churches. 9 Tyndale later put his name to his work because others were taking it, changing it, and publishing it. He realized that readers needed to know who the author was, to consider if it was trustworthy. 12 Daniell, Introduction to Tyndale’s New Testament, vii. 13 Daniell, The Bible in English (New Haven and London, Yale University Press, 2003), 448. The reference to 76% is to that portion of the Old Testament that Tyndale was able to complete before his execution. 14 Daniell, in his Introduction to Tyndale’s New Testament at page xxviii, explains that this was largely because Tyndale was considered a Lutheran, and therefore a heretic. However the reasons perhaps went deeper than that, a question which is partly explored in other articles on this website.